Planning our trip to Hobart the first thing we did was ask for restaurant recommendations. 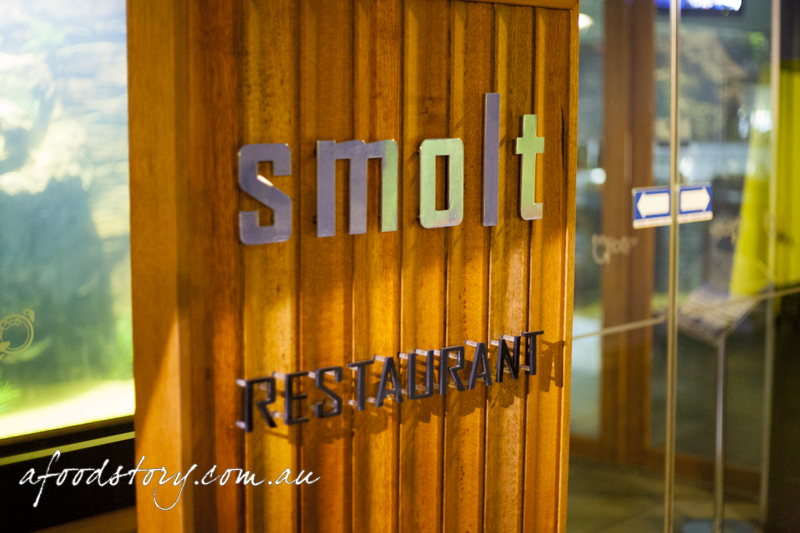 smolt was a name that popped up a number of times and dinner was booked in well in advance of our trip. smolt, meaning baby salmon, is a partnership between Kif Weber and Scott McMurray, owners of Tasmania’s largest salmon producer, Tassal, and popular Launceston restaurant, Mud. 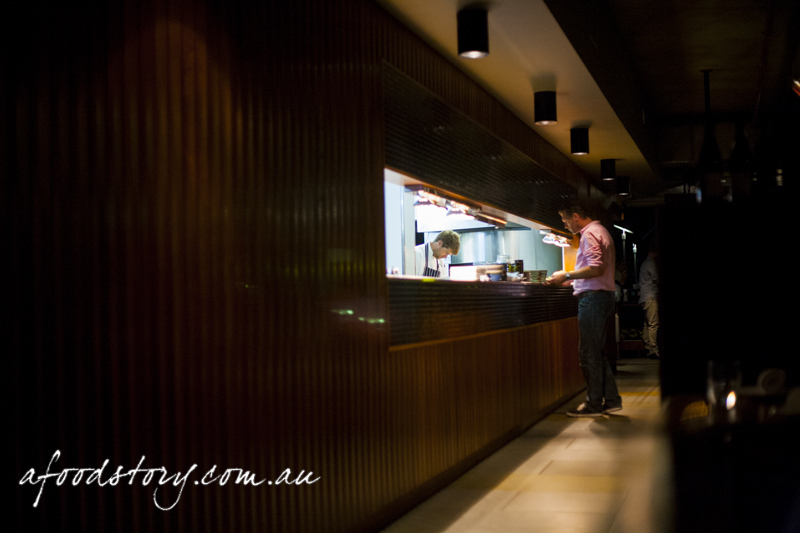 The restaurant is dark and warm, the perfect retreat from the chilly Tassie autumn air. The restaurant is divided into three sections with black banquettes, wooden tables and an open kitchen. We were seated towards the back of the restaurant and handed menus. After a quick run-down of the menu the waiter explained they also have a progressive style menu where you set the limit per person and they build a menu to suit. 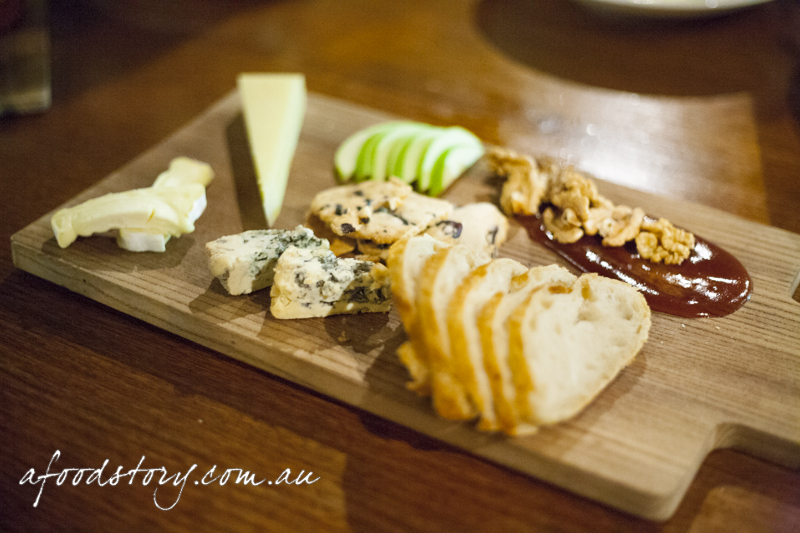 You know the Hungry Hippos love degustation style dining and this sounded like the perfect way to sample their menu. We were sold. How much to spend? The waiter suggested somewhere between -80 and naturally Mr O agreed on per person. Little did we think about how much food was to follow. 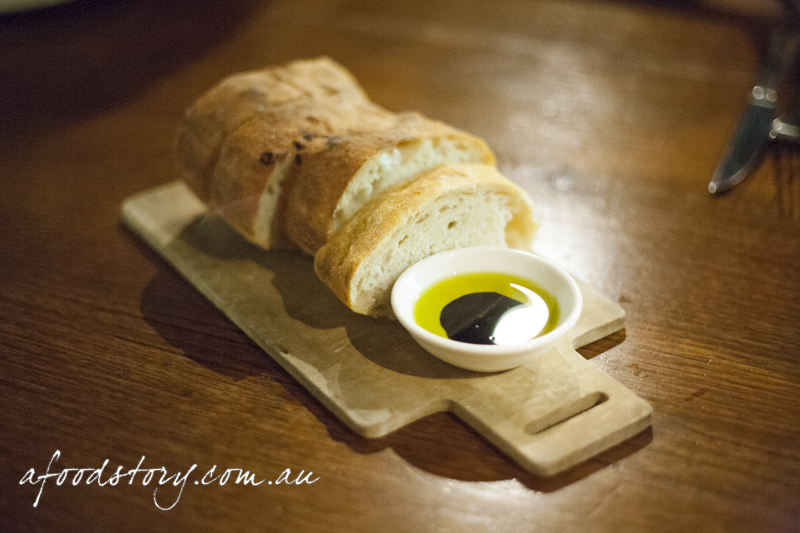 bread, EVOO and balsamic vinegar. In traditional degustation style things kicked off with some bread. On this occasion it became a point of contention with Em not a fan but Dylan and I quite fond of the house made bread. A ciabatta with a crispy crust and dense, slightly chewy (in a good way) centre, doused in olive oil and a little balsamic. 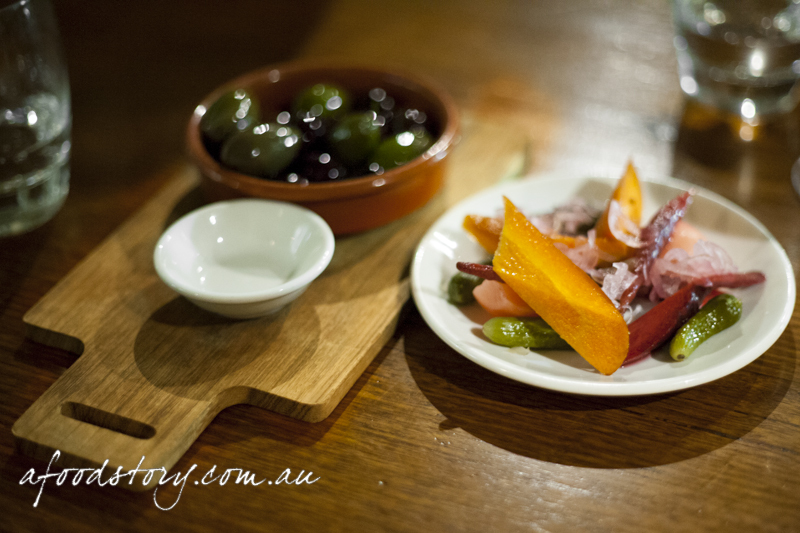 smolt olives and selection of house made pickled vegetables. Following the bread was a bowl full of warm, meaty olives, both green and Kalamata, along with a vibrant plate of house made pickles. The other three divvied up the pickles while I polished off most of the olives. Dylan was enamoured with the cornichons and shreds of onion but found the carrot and beetroot a little firm to the bite and in need of a little more softening. leek and three cheese arancini. 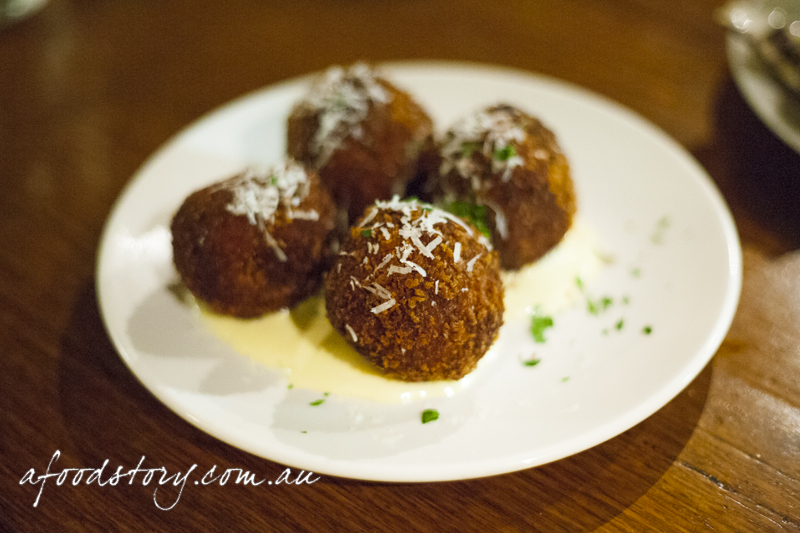 Arancini, oh how I love you. These little morsels were completely divine. I bit through the crunchy shell to discover a piping hot centre of leek and cheesy goodness. We could have easily demolished several of these each but there was so much more to come. Bruny Island oysters, shucked to order. 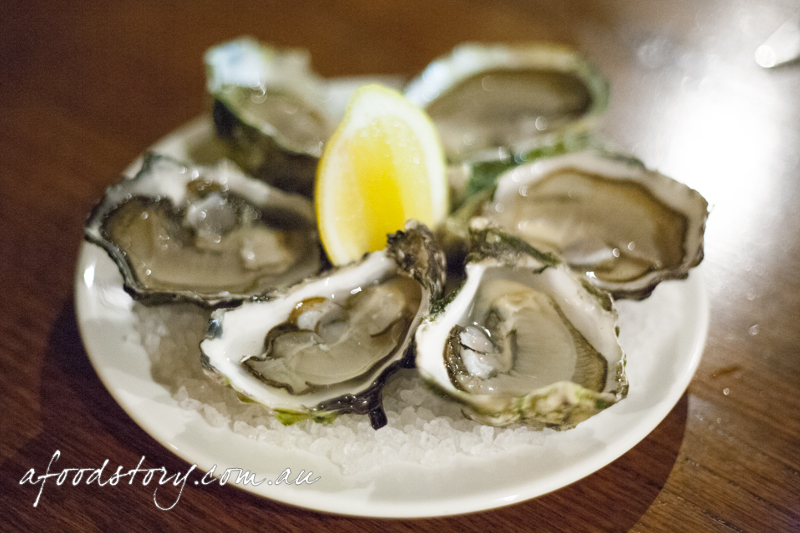 Continuing the Tasmanian oyster feast, we were greeted with a half dozen Bruny Island oysters. You might think six oysters is difficult to share between four people but Em cannot stomach them so it was an easy split – two each for the guys and I. smolt shuck oysters to order and it was nice to see the oysters served in their natural brine. However, I can’t say I’ve ever had so much brine and found it a little overwhelming. Oyster purists would probably crucify me for pouring half the brine out, but once I had reduced the level of brine these were little beauties of the sea that went down a treat. hot and cold salmon special. Our progressive meal included the special of the evening, a hot and cold salmon tasting plate. Half the dish was cold with some gorgeous smoked salmon, tart cornichons and hints of mint and fennel but it was the hot half of the dish that stole the show. Deep fried salmon brandade. Oh yes that is right, little morsels of smooth, creamy brandade deep fried until the outer is golden. The end result is a lightly smoked, fishy, silky centre and a crispy outer. 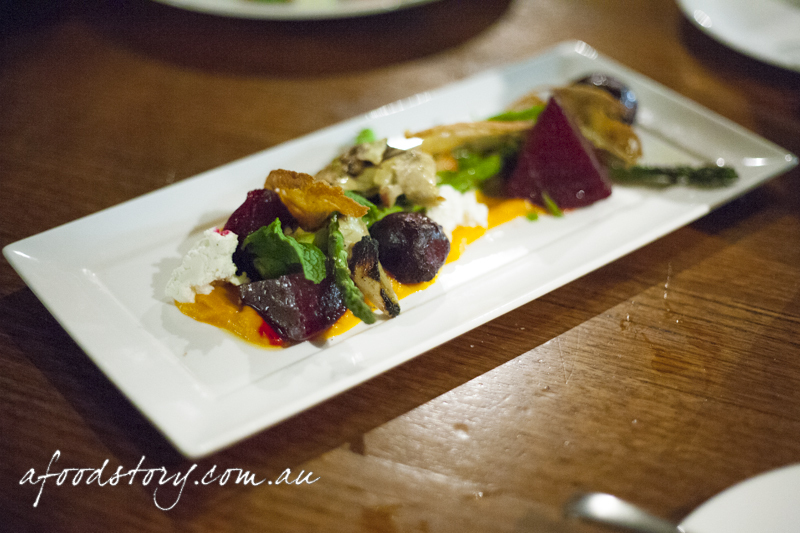 roasted beetroot, asparagus, artichoke, caramelised pumpkin puree, Kettering grown hazelnuts, goats curd salad. I really want to love beetroot, but I really don’t. No matter what form I just struggle to enjoy it. There is something about its earthiness that just really weirds me out. I am of course the minority with the others all enjoying this dish. I simply left the beetroot to one side and focused on the rest of the salad. 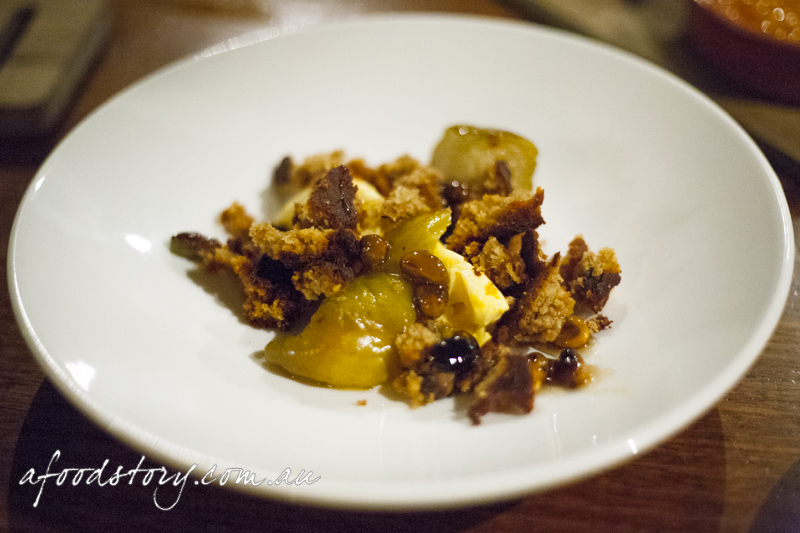 I loved the combination of hazelnuts and goats curd (ever since I discovered the combination of truffled honey with hazelnuts and goats cheese at Lowes Mount Truffiere I have been in love with it). Combined with charred vegetables this was a substantial and tasty salad. Another dish that wasn’t to my liking… condiment hell. Of course the quail egg was poached well with its gooey insides on display. Although avoiding all of the creamy-astringent-Lex-unfriendly sauce I did sample some tuna and veal. Dylan was quite happy with the dish, some very fresh and meaty tuna and some rather juicy strips of veal brought together with house made mayonnaise. School prawns treated to a light batter and deep fried are such a wonderful textural addition to any seafood dish, and when it is seconded with crispy skinned fish things get better. While we enjoyed the well cooked fish and crunchy school prawns the sauce didn’t live up to our expectations. With only a very mild amount of flavour that could have been mistaken for any normal white seafood sauce, we simply wanted the capsicum to come through more than it did. 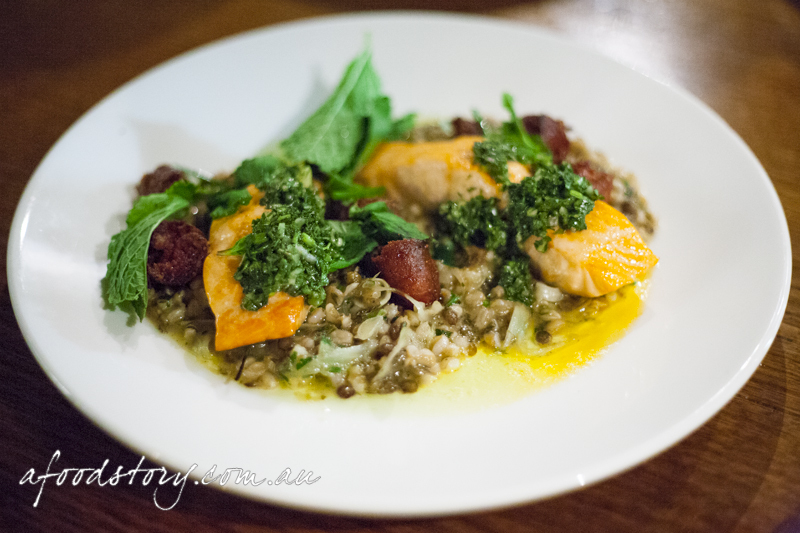 grilled Tassal salmon, faro and du puy lentil braise, chimmichurri, chorizo & herb salad. 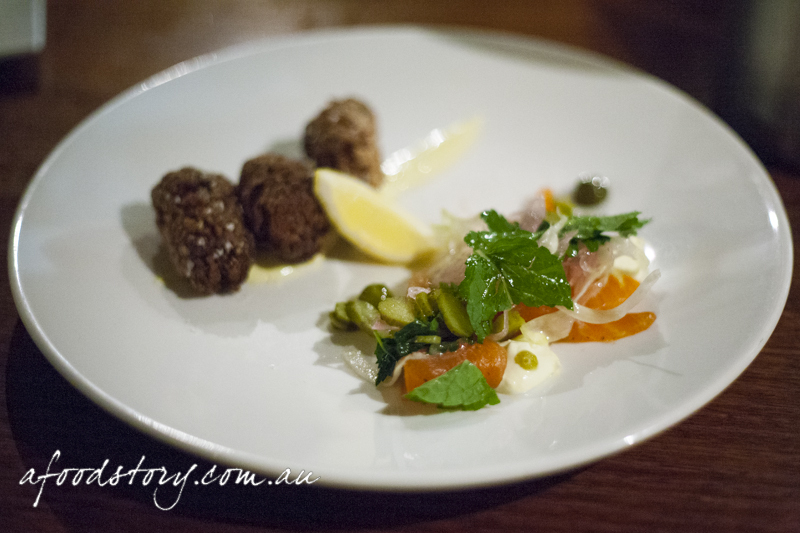 Kings of Tasmanian salmon, I had high expectations for this course and luckily I was not disappointed. The salmon was grilled to perfection. The faro and du puy lentils were warming, hearty and oh so delicious I had to keep returning for more. I couldn’t really work out the connection with the chorizo in the dish which was out of this world salty, drier than we ever thought possible and simply didn’t fit. Nevertheless this was a lovely dish, chorizo excluded. 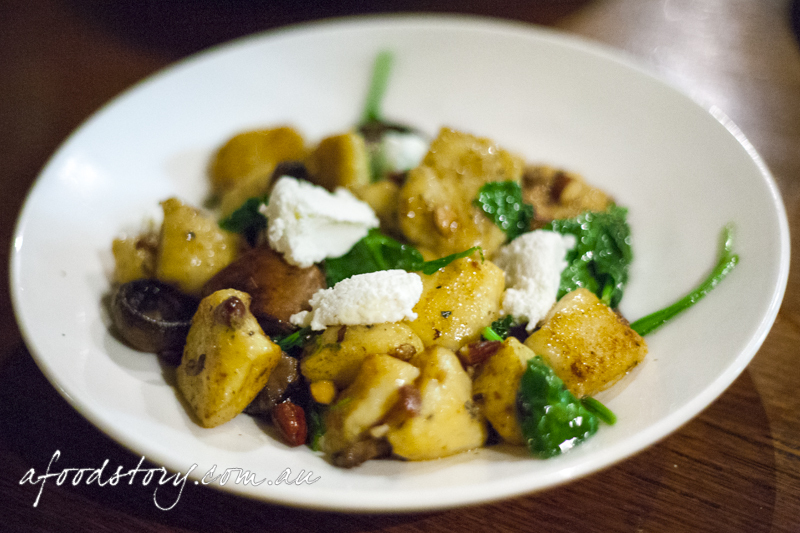 pan fried house made gnocchi with wild mixed variety mushrooms, baby spinach, toasted almonds, Tongala goats curd. When gnocchi is made well it can be one of the most spectacular dishes on earth. Was I sceptical about smolt’s gnocchi? Yes. Was I proven wrong? Hell yes. It may sound like a cliché but the gnocchi were pillowy soft and simply melted in the mouth. Honestly they were the softest, most tender gnocchi I have ever eaten and just writing about this dish makes me want more. Earthy mushrooms, creamy nuttiness of the almonds and the sharp acidity of the goats curd rounded this out to be the dish of the night for Dylan, Mr O, Em and I. It is rare all four of us agree but this dish simply stole the show. 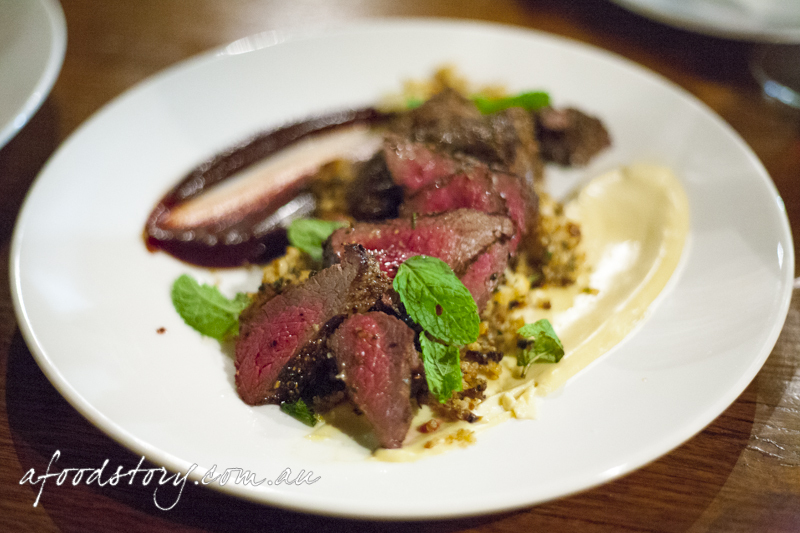 grilled Tasmanian venison, crab apple puree, quinoa, spiced cauliflower & almond salad, creamed garlic. 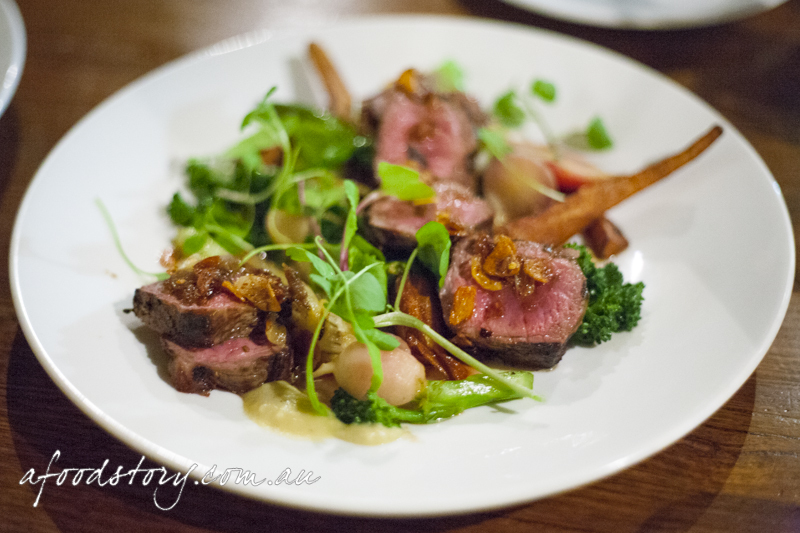 Blushing pink, I was excited to see the venison arrive at the table. Unfortunately I found the meat a little on the chewy side as it was only luke warm. The venison went cold rapidly and I quickly lost my interest. Quinoa for crunch, cauliflower with a nice amount of spice and a sweet date puree all worked so well, but with the supposed hero of the dish not showing any magic the rest all sadly went unnoticed. locally farmed lamb leg primal, seasonal spring vegetables, smoky eggplant puree, chilli, garlic and anchovy dressing. A generous serving of locally farmed lamb with spring vegetables. So much potential yet similar to the venison it just wasn’t served as hot as it should have been. Of course the venison and lamb were both following the gnocchi which was an exceptional dish and extremely difficult to surpass. roasted local pears, chilled orange blossom cream, crumbled Persian love cake, pistachios and Miellerie honey. Local pears, roasted to the point of tenderness with a slight bite, the perfect way to cook a pear. Combined with the chilled cream with a wonderful citrus zing and love cake that had a wonderful level of spice. Nutty, creamy, sweet and tart. This dessert had a little bit of everything and I thoroughly enjoyed it. fragrant creme Catalan, chocolate truffles. 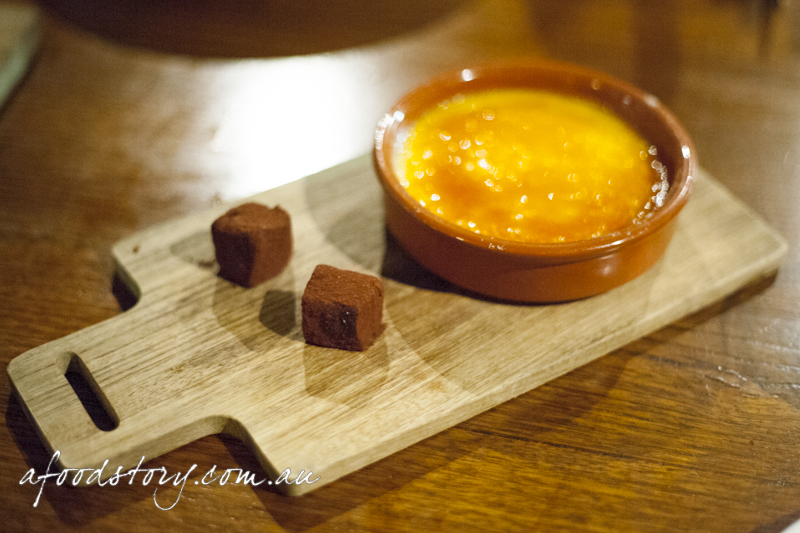 Creme brulee or crema catalana are one of the best desserts ever. They’re easy to make but easy to get wrong. Luckily smolt did not fall down when it came to desserts. The custard was silky smooth and full of flavour. I wasn’t convinced of the combination of the bitter chocolate truffles but I did love them on their own. Excessively full by this stage they were not done with us yet. When we thought there could be no more out came a cheese board of large proportions. I do love cheese yet rarely order it in restaurants as I love sweet things even more. Although I was bursting I couldn’t pass up the goods before us. I couldn’t get enough of the intense blue and oat cakes. Service was friendly and attentive. The meal was an extremely generous serving with a handful of good dishes and a couple of really great dishes. 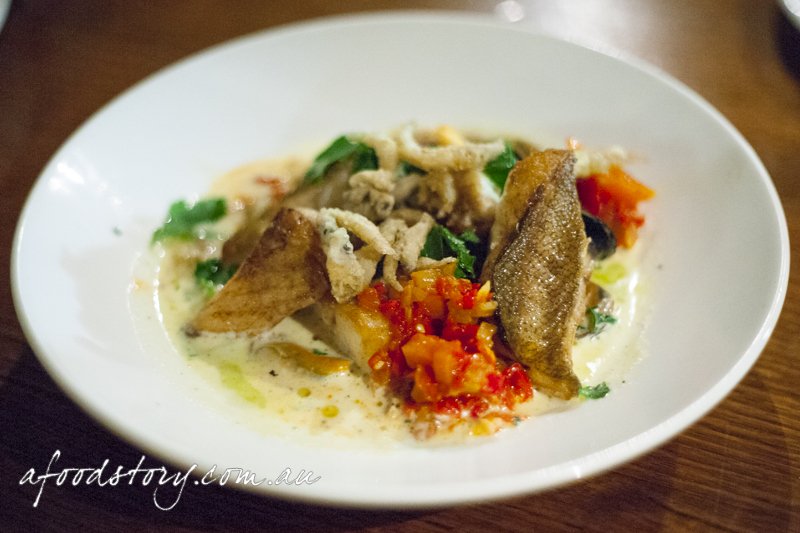 I loved most of what I sampled at smolt and would highly recommend it to anyone heading to Tassie. We returned for brekkie and more coffee during our four day trip to Hobart. Wow. I was in Hobart for MONA-FOMA in Jan 2013 and ate at Smolt twice for dinner and was never offered this “menu”. Looks fabulous. I’ve also had breakfast there. 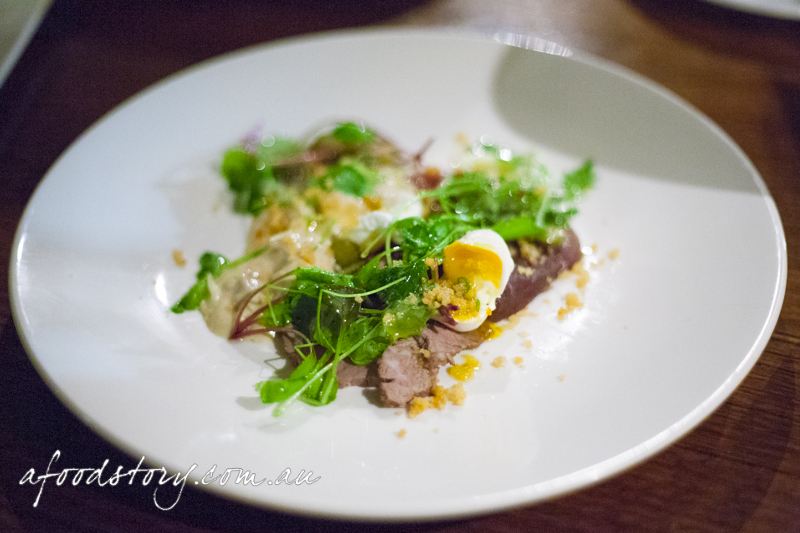 It’s a class act and much easier to get into than Garagistes, which still sits in my top 10 Aussie restaurants. My score 14.5/20. BTW Score meant for Smolt, not Garagistes which I see has a post there too 😉 I need an edit button ! !